J.B. Spins: Rob the Mob: What Could Go Wrong with that Plan? During 1991 and early 1992, New York was about as depressed as depression gets. The only ray of hope came from a series of high profile organized crime prosecutions initiated by then U.S. Attorney Rudy Giuliani. Yet, somehow John Gotti, the “Teflon Don,” kept wriggling out of the net—at least until Sammy “the Bull Gravano” turned state’s evidence. His testimony would also reveal the locations of several mafia-affiliated “social clubs” in open court. Tommy Uva used this information for the extraordinarily daring but not particularly well thought out crime spree that inspired Raymond De Felitta’s Rob the Mob (trailer here), which opens today in New York. Uva is a loser, but Rosemarie loves him anyway. However, the rest of the Uva family still blames him and his lowlife ways for the death of his father. Uva on the other hand, vehemently blames the mafia loan sharks for their family tragedy. You could say he has a bit of a complex when it comes to wiseguys. After a brief prison stretch, Uva gets a job with Rosemarie’s debt collection agency—probably the only business hiring during the Dinkins years. However, he is preoccupied with the Gotti trial. When he hears Gravano explain guns are verboten in their neighborhood front clubs, Uva hatches a very dangerous idea explained pretty clearly by the film’s three word title. One night, he takes in a pretty paltry score, but one of the old-timers at the Waikiki Club happened to be carrying something seriously incriminating. As films go, Rob is about as New York as it gets. The period details are spot-on and the attitude is razor sharp. Nobody cares what the New York Times has to say in their milieu. The journalist who gets the Uvas’ story is naturally the Post’s organized crime beat writer, Jerry Cardozo. De Felitta (better known for dramedies like City Island and docs, such as ‘Tis Autumn), deftly juggles the large ensemble of gangsters, cops, reporters, and Uvas, maintaining an appealingly gritty vibe. 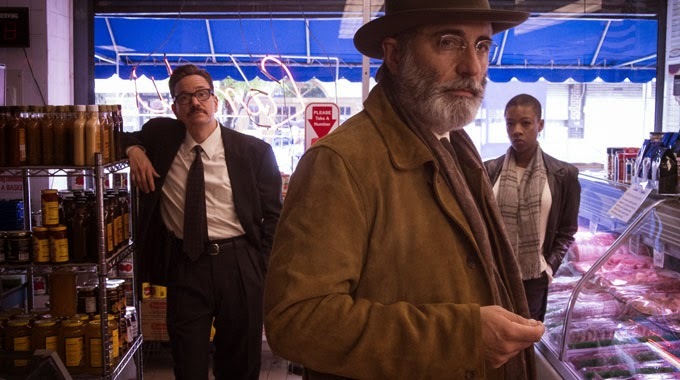 However, the ace up De Felitta’s sleeve is once again Andy Garcia, who plays the composite don of dons “Big Al” Fiorello with tragic dignity worthy of a Shakespearean figure. As Garcia slowly reveals his backstory, we come to understand Fiorello reluctantly reached his current position through a strange twist of fate. He is a complicated figure, but he is about the only ethically nuanced gangster. In contrast, his underlings are a craven lot and just about everyone on either side of the side thinks Gotti is complete pond scum. While he does not quite knock it out of the park like Garcia (partly because De Felitta does not pitch him comparably fat fast balls over the plate), Ray Romano’s characteristic nervous energy and deadpan delivery still nicely serve Cardozo, a substantially straight dramatic role. While their over-the-top outer borough affectations are rather off-putting at first, Michael Pitt and Nina Arianda still develop some rather touching (and convincingly reckless) screen chemistry as the couple ironically dubbed “Bonnie and Clyde” by Fiorello’s gang. However, for real old school street cred, nobody can touch Burt Young doing his thing as aging mob lieutenant Joey D.
Granted, everyone will readily form an educated guess of the general direction Rob is headed, even if they are not familiar with the Uvas’ case, but De Felitta’s sure-footed execution will still keep viewers keyed in from start to finish. Featuring an award-worthy supporting turn from Garcia, Rob is one of the best American gangster films in several years. 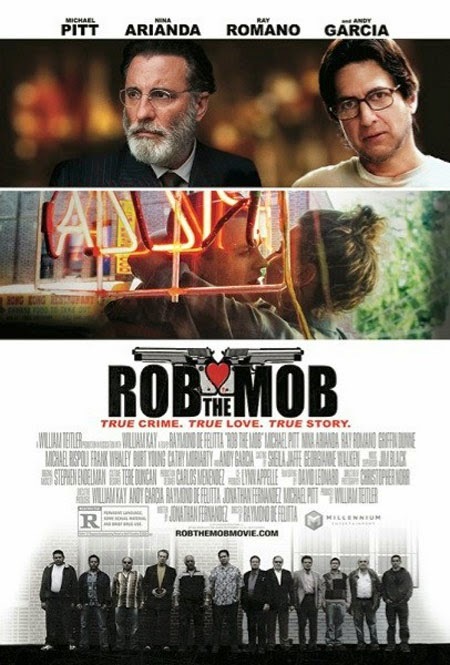 Particularly recommended for New Yorkers (who might be getting a glimpse of our de Blasio future as well as our Dinkins past), Rob the Mob opens today (3/21) at the Angelika Film Center.